Eliminate the stresses of long queueing and maximise your time exploring one of the greatest cities in the world with this same day fast track ticket! No need to redeem your ticket, this fast track ticket will make you skip the majority of the queue for your ride on one of London’s most famous landmarks – the Coca-Cola London Eye! Step into one of the iconic glass capsules and ride high above the clouds as you soak in sensational views of the capital. From 135 metres above ground level, you’ll get to London from one of its most beautiful viewpoints as you enjoy sights of the Queen’s official royal residence, Buckingham Palace, the formidable Tower of London, the historic Houses of Parliament and on a good day, you can even see as far as Windsor Castle! Enjoy watching the River Thames glitter beneath you as you enjoy one rotation around the London Eye for 30 minutes; the perfect amount of time to capture the moment with a selfie or two! Once you’ve descended, you’ll get to enjoy the heart-warming London Eye 4D experience. 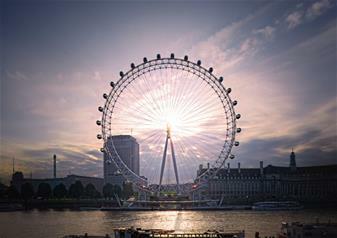 Your same day fast track ticket includes the London Eye’s wonderful 4D experience. This immersive experience uses special effects of bubbles and mist to bring this heart-warming tale of a father and his daughter on a day out to London to life – an unforgettable end to your London Eye adventure!